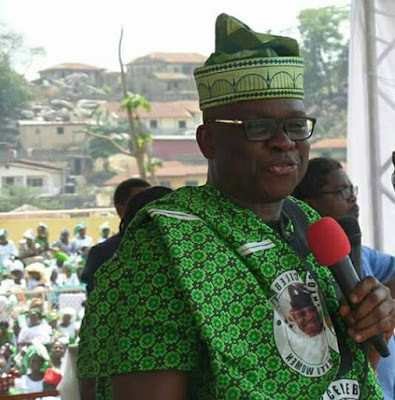 The Ekiti State Governor, Ayodele Fayose, on Thursday shut down Ekiti for the mega rally and official presentation of party’s flag to his deputy and governorship candidate of the Peoples Democratic Party, Prof. Kolapo Olusola. “The people of Ekiti, I have known you since 1992, all the projects completed which took Ekiti to a higher level have been done by the PDP alone. PDP guarantees you good hospital, road, infrastructure, education and many other dividends of democracy. The Punch reports that Fayose had declared Thursday as a public holiday for workers in the state. Fayose said he won’t receive President Muhammadu Buhari on Tuesday because he had not done any project in Ekiti to deserve that. He also berated the Federal Government for allegedly closing the Akure Airport at a time the PDP leaders were coming into the state for the rally. “I want to condemn the Federal Government for the act, it is shameful for whoever has done that. That’s not patriotic; it is shameful. Fayose urged the PDP members and supporters to shun violence but to use their votes to defend their rights. At the event were Governors Nyesom Wike (Rivers), David Umahi (Ebonyi), Emmanuel Udom (Akwa Ibom), Ibrahim Dankwambo (Gombe), Ben Ayande (Cross-River), Darius Ishaku (Taraba), Ifeanyi Okowa (Delta), Okezie Ikpeazu (Abia) while Seriake Dickson was represented by his deputy, John Jona. The list also included former governors: Otunba Gbenga Daniel (Ogun), Sule Lamido (Jigawa), Attahiru Bafarawa (Sokoto), Babangida Aliyu (Niger), Peter Obi (Anambra) and Ahmed Makarfi (Kaduna) as well the Chairman, PDP Board of Trustees, Senator Walin Jibril, and members of the National Working Committee, among others. Leaders of ethnic groups, student unions in Ekiti, Okada riders, road transport unions and National Union of Local Government Employees also attended the event.